Have you made your content AMP ready yet? 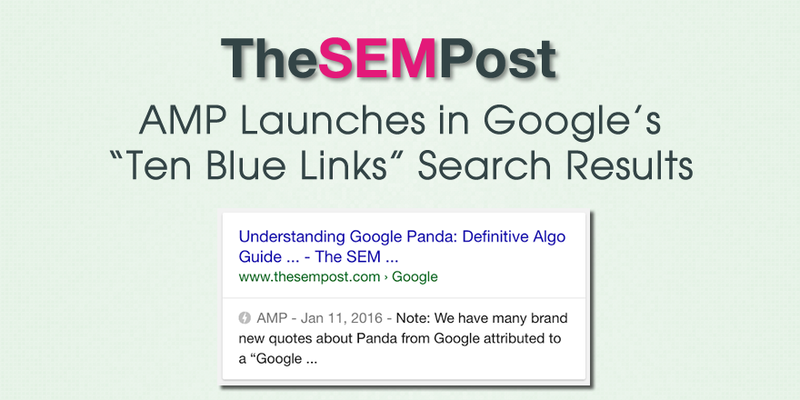 Google has officially turned on AMP results in the “ten blue links” in their mobile search results. This means when a webpage has an AMP version available, Google will swap out the non-AMP version and display with AMP version instead, complete with the AMP tag in the search results. Google has confirmed multiple times that there is not a ranking boost associated with a page being in AMP or not (although this could change in the future), nor will a site be negatively impacted if they don’t use AMP. However, as searchers become more familiar with AMP and how it works, there will likely be an increased clickthrough when a page is in AMP, especially if other similar results are not AMP. If there is no AMP version, Google will still continue to show the mobile friendly version of the page over the desktop one. Google also revealed there are more than 600 million AMPlified pages in the search results, which is a significant jump from the 150 million they announced earlier this year at Google I/O. AMP hasn’t rolled out to all users or locations yet, although the planned rollout is worldwide. I have seen them in testing previously, but I still don’t have them in my own mobile results. If you don’t have them yet, you can use the AMP demo or use the Chrome extension, which also is an AMP validator.